Sorry. I had to. This image from Bike Wires just captures the spirit of the Cannibal. 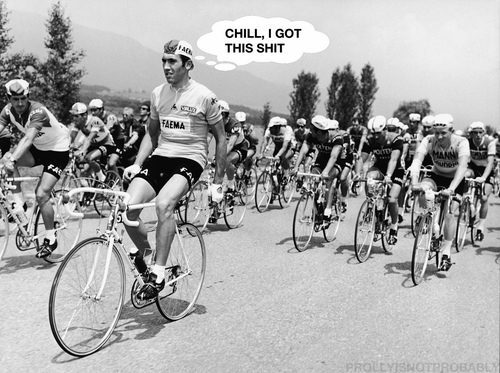 Belgian cyclist Eddy Merckx sits up on his cycle and takes it easy as he leads the pack during the eighth lap of the Tour de France, 1969. This would be the first of five victories for Merckx at the Tour de France. I always loved the Faema jerseys and Eddy Merckx bikes.